Could The Dark Knight and Batman Arkham Asylum share disc space? With the announcement that Sony is working on Blu-ray movie/videogame hybrid discs, TechRadar spoke to two experts in the gaming and home entertainment industry about the new concept. Daniel Dawkins, editor of PSM3 magazine, was interested in the idea, but it largely depended on the movie and game on offer. "Sony needs a USP to differentiate their higher price console over Xbox 360, but this is a curious solution," said Dawkins. 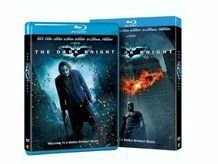 "There are a few decent candidates – Batman Arkham Asylum with The Dark Knight on Blu-ray, perhaps? But the prospect of, say, a new Resident Evil game with one of the largely atrocious films doesn't appeal." Alastair Upham, Editor of DVD & Blu-ray Review magazine, is a bit more upbeat about the hybrid concept. We should find out by the end of 2009 whether these new hybrid discs will be the savior of the Blu-ray, or just another Profile 2.0 debacle. "It's definitely a positive thing for the home entertainment industry, as it may bring people to Blu-ray that have never thought about buying into the format before," he explained. "Studios now have a chance to showcase exactly what HD movies can do, and you couldn't ask for a bigger audience." Even though the hybrid discs will show off the PS3's vast 50GB capacity, Dawkins thinks that Sony should focus on creating better games before it diversifies. "The PS3 just needs more exclusive, appreciably better-looking games with surprising, or progressive, gameplay," explains Dawkins. "Killzone 2 ticks two of those boxes, but it is too rooted in FPS folklore to genuinely dazzle people and force them to buy PS3." Upham disagrees, however, and thinks that targeting PS3 users is good for the Blu-ray format. "Although it's perhaps a little too PS3-centric, with the added value only going to those who've already forked out for the BD capable console, it's a start, and with more cross-platform strategies there's an opportunity to give the format a much needed boost."